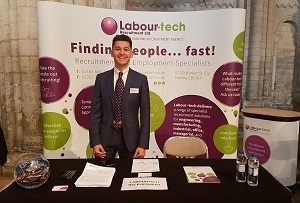 Labourtech were at the East Cambridgeshire Careers and Skills Fair at Ely Cathedral again this year. The event was aimed at Year 11 and 6th Form students from the local area and gave them an opportunity to talk to top employers in the region. Labourtech's George Harrison was on hand throughout the day to give students advice on the opportunities available and the types of skills and qualifications required for certain roles and industry sectors.